Today I’m offering a wonderful engraving circa 1890’s. 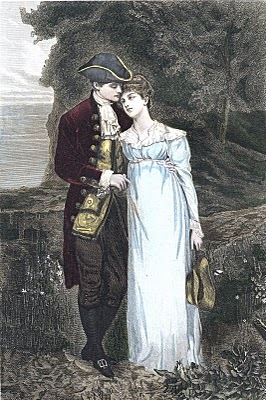 This one features a young couple in love. I adore the Empire style dress the woman is wearing, it’s so Jane Austin -esque! Perhaps you can make a lovely Valentine’s Day card with this one for someone you love! Vintage Serious Cherub with Wings Image! 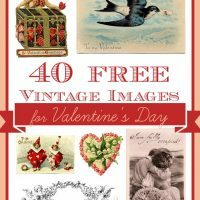 Free Vintage Clip Art Men’s Collars and Cuffs 40 Free Valentine’s Day Images! What a sweet young couple. The girl has such a dreamy, faraway look in her eyes. I wonder what she is thinking. Karen…Thank you for always offering us so many wonderful graphics. May your Valentine’s Day be filled with love overflowing. You bless us. do you still have your older peach tone button that I can add to my blog. It got erased from my blog. I use your wonderful graphics on my blog. Thanks! I hope you all are having a wonderful Valentine’s Day too!! I doesn’t look like I have the old one anymore, I deleted a bunch of things awhile back and it probably was one in that group. Ah, so pretty! I hope you’re having a wonderful Valentine’s Day. I am a new visitor to your site. I love all the great graphics. You have inspired me to put my own post card collection on my site. I also added your button to my site. If any of your readers are interested, I am at forget-me-never.com and they can check out my images as I add them and use them as they wish. Oh Karen…IM SO EXCITED! I can’t believe you are going to feature my banners on your Brag Monday! This could help me get my little etsy shop…..Thank you sooooo much! You are very welcome!! It’s well deserved, they are adorable! Happy Valentine’s Day to you also Karen. I wish you lots of love and happiness on this beautiful day.